One of the GTA’s premier automotive families looks to the future after a storied past. Nostalgia falls over the glass-walled boardroom of the Porsche Centre Oakville dealership, as Basil, Tony and Paul Policaro reminisce about the long days and late nights they invested in building their automotive empire. Paul speaks up as he recalls a favourite saying of their father’s. 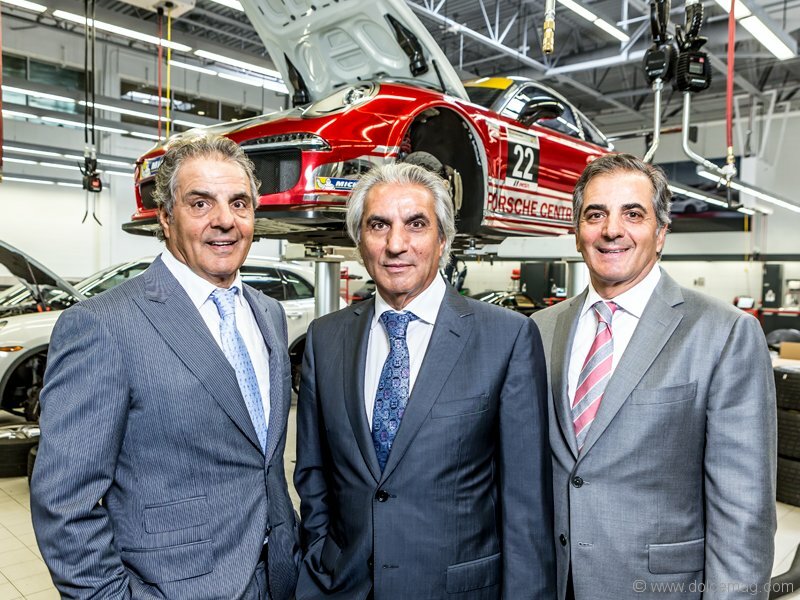 This philosophical sentiment — a fundamental fact of life that your actions shape your reputation — has been at the heart of how the Policaro Automotive Family has conducted business for over three decades. It’s a maxim the Policaro patriarchs are now passing on to the next generation. 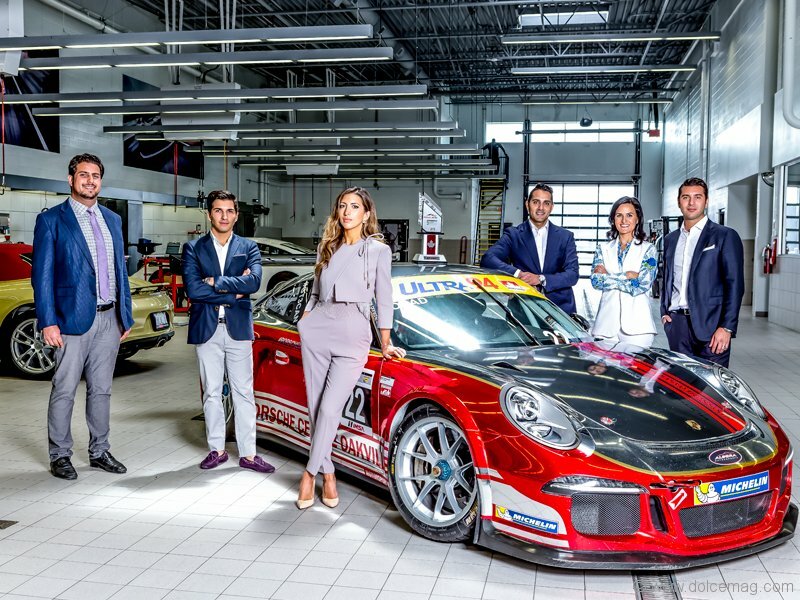 It’s the day after the Honda Indy, where the Policaros’ newly established racing team claimed the checkered flag in a race in the Ultra 94 Porsche GT3 Cup Challenge Canada by Michelin. “Second race, first win,” beams Tony, the middle brother and the dealer principal of Northwest Lexus, Northwest Toyota, Northwest Scion and Porsche Centre Oakville. You can hear chatter and the odd bit of laughter from the showroom below, where half a dozen of their children playfully pose for the camera among the 911s, Boxsters and various other gleaming Porsches resting in the 55,000-square-foot facility. This is a tight-knit family, no question — you don’t need Fortune Policaro to tell you about how he can’t remember a Christmas or a birthday party where they weren’t all together, or Lina Policaro-Pavkovic to explain how they’re always all going out for dinner together, to see just how close they all are. And it seems to be a winning formula. Since Basil, Tony and Paul started in the business well over 35 years ago, they’ve ascended from a small Honda dealership in Brampton to an automotive powerhouse that operates eight franchises, employs over 450 people and is aiming for $270 million in sales this year — a commendable achievement in an era where brand loyalty has never been lower. Their shelves are stocked with awards, including a recent 2014 Pursuit of Excellence Elite Award for Northwest Lexus, the sixth consecutive year the dealership has won the award and its 13th overall; their 13th Acura Client Excellence Award for Acura 2000; and, after only one year in business, the 2014 Premier Dealer award for Porsche Centre Oakville, of which only three are given out in Canada annually. When asked how they did it, the answer is simple: hard work, honesty and a focus on customer satisfaction. “Our name was built on customer satisfaction,” explains Basil, the dealer principal of Family Honda. “The key goal is putting the customer first,” adds Paul, the youngest brother and the dealer principal of Acura 2000, Team Hyundai and their latest acquisition, BMW Brampton. Each brother brings their own flavour to the table. Paul, an avid golfer and self-proclaimed hockey nut, is soft-spoken and calculated, exuding the quiet confidence of an old soul. Tony, who enjoys his popcorn thriller novels, possesses the smooth demeanour and velvety cadence of a natural salesman and a sharp businessman. And then there’s Basil: the self-assured big brother who emanates a glowing personality that has no trouble bringing people together. But while these silver-haired siblings sit atop their industry today, their roots are far more humble. Their parents moved the family from Italy to Canada in 1966. It was a difficult time for the brothers, leaving behind everything and everyone they knew. Their father was a labourer and instilled a blue-collar work ethic in his boys. Paul explains that, “As young children, we learned to work hard. We always had a job.” He worked at a bakery and a barbershop, while Tony worked at a family friend’s grocery store. “Three dollars a week cutting boxes,” he recalls with a chuckle. Basil was 21 at the time and needed a steady paycheque. He worked for a plating company in Toronto, re-chroming bumpers and mouldings. But he left when the foreman refused to pay him the additional 30 cents an hour that the guy working the same job on the opposite shift received. Not wanting to return home and explain to his parents why he was now jobless, he stopped at the Fiat dealership in the Bloor and Christie area where his best friend’s brother worked. After Basil explained his predicament, the friend asked his boss if there was an opening. “He offered me $100 a week to be a lot man,” Basil explains. When his brothers were a little older, they joined him and began their journey in the industry in modest fashion: washing cars. Eventually, their opportunity arrived. Paul heard rumblings that the owners of his Brampton dealership were thinking of getting out of the business. He approached them and explained that if they wanted to sell, he and his brothers were interested in buying. The only problem was they were short on funds. In order to front the cash, Tony sold his Mississauga home and Basil mortgaged his to the maximum. It was a mammoth, life-defining risk with grand existential ramifications that could have proven disastrous if they failed to succeed. “It must have been the entrepreneur in us that even at such a young age we said, ‘Let’s do it,’ and we had no fear,” says Tony. But even with that money, they still weren’t quite there financially. Their parents agreed to mortgage their home as well. Tony recalls his father’s words: “He goes, ‘I know you guys. If that doesn’t work out you’ll do something else. I know I’ll never be thrown out of this house.’” It was a gesture that gave them the support and confidence to press onward. With that help, they were able to purchase 50 per cent of the company in 1979, becoming the active partners of the dealership while the previous owners remained as the silent partners. They poured their heart and soul into the business, working 12-hour days, six days a week. In 1983, they opened a Hyundai dealership with the same partners. But, as time and the business moved forward, they had different visions for the growing company and soon split with their silent associates. Their partners stuck with Honda and the Policaros went with Hyundai. While they’re still hands-on in the business, the Policaro brothers are excited about the next generation taking an active role. Basil’s son Francesco, for example, is general manager at Porsche Centre Oakville, and Paul’s son Francesco will be helming BMW Brampton when its 60,000-sq.-ft. facility opens in early 2016. While the children have a new vision for the future of the company, such as implementing a strong corporate structure for a streamlined process, they’ve also embraced their fathers’ same values of honesty, integrity and hard work. For Aurora Policaro-Giannace, administrator at Family Honda, seeing how much their fathers have invested — financially, mentally and corporeally — spurs that sense of responsibility to honour those efforts. “And hopefully we can be as strong together and as close as they were to accomplish what they did,” she says. And, of course, they’re committed to upholding the family name. After all, the only thing they have in life is that Policaro name, and they’ll never lose it.